Welcome to the efficacious learning space, Eduncle! The selection of career in this prevailing era has become very complex and competitive. You cannot choose your career based on the sayings like “Follow your passion” or “Do what you are good at”. Be it your passion or the thing you are good at, is indeed a result of lot of practice and learning. It is better to find your interested areas at your school stage, so that you can further take it as your career choice. If your interest revolves around science & technologies, then JEE Main 2019 is undoubtedly the wise choice to lead you towards your goal of getting desired career opportunities in future. You all must be aware of the fact that Joint Entrance Examination (Mains) 2019 is one of the most prominent Engineering Entrance Exam in India. By qualifying the exam, you can easily secure admissions in various IIITs, NITs, and CFTIs of the country. But if your aim is to be a part of the Top IITs in India, then IIT JEE Main 2019 is the first stride to help you in showing the way to reach the edge. To get admissions in the Indian Institutes of Technology (IITs), you need to qualify JEE Advanced 2019 Exam, which is the second phase after Qualifying JEE Main 2019 Exam. In this online disquisition below, we have summed up all the crucial information that you will need for staying on track while cutting across the journey of cracking JEE Main Exam 2019. JEE Main 2019 Exam is conducted by the acclaimed exam governing body NTA (National Testing Agency). NTA planned the exam for those students who are approaching distinct ways to explore learning through the eminent Science and Technology institutions of the country. 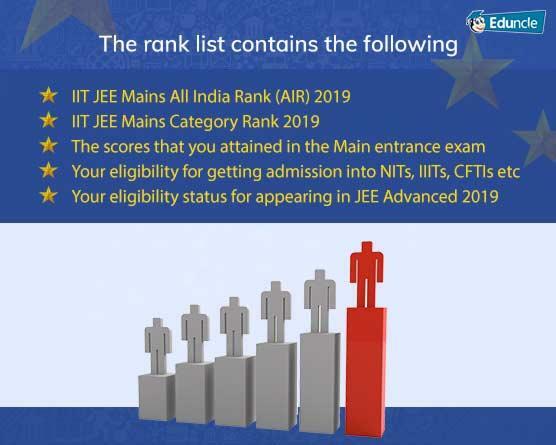 By getting triumph over JEE Mains 2019 Exam, you will find a move to get admissions in undergraduate engineering programmes at NITs (National Institutes of Technology), IIITs (Indian Institutes of Information Technology) and various CFTIs (Centrally Funded Technical Institutions) positioned at every edge of our country. The exam is conducted by following a systematic process starting with JEE Main 2019 Registration and ending with the counselling process. 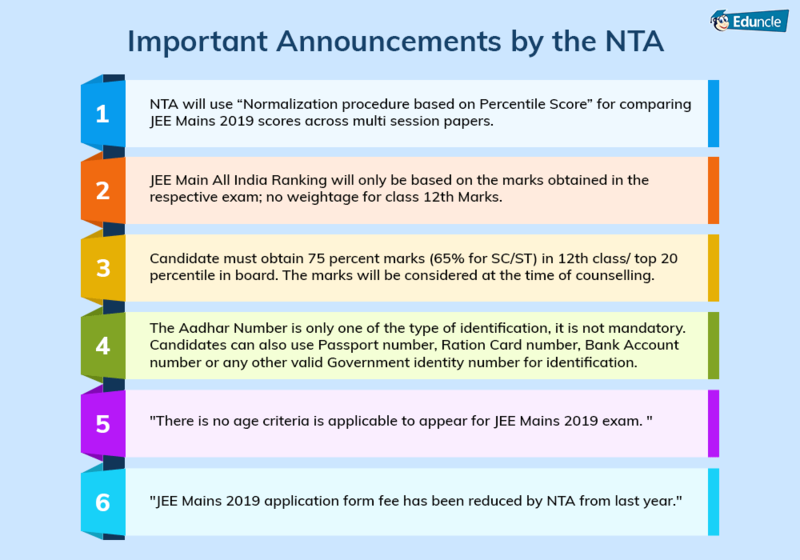 In the meantime, frequent JEE Mains 2019 news and updates are released by NTA to help the aspirants planning their studies. Candidates, who want to appear for the exam this year, must read all the details stated below. It is mandatory to know every aspect of the examination, before making JEE Main 2019 Registration. We have stated earlier that JEE Main 2019 Exam follows a predesigned structure. In the previous year, the exam was conducted in the month of April. As per the latest notifications, NTA will conduct the JEE Mains exam twice a year from 2019. JEE Main was conducted from 08th to 12th January 2019 and will be conducted again from 07th to 12th April 2019. All the important JEE Main 2019 dates are combined below in the form of a table. It will help you in marking the dates for every event easily. Kindly read them carefully. Note - Candidates who are applied for the JEE Main 2019 exam can check out their examination dates and shifts by login on Official Website. 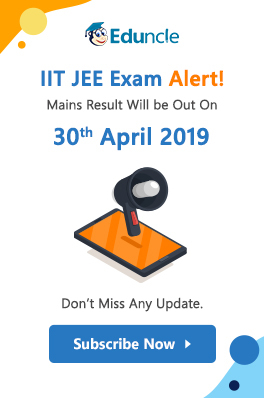 JEE Main 2019 Eligibility - Check Whether You are Eligible or Not! There is no age criteria is applicable to appear for exam. JEE Main 2019 Eligibility Marks etc. Along with these eligibility conditions, the candidates who have dropped a year for preparation can look upon the JEE Main Eligibility criteria for droppers. Filling the online JEE Main application form is the initial step to be made in order to appear for Joint Entrance Examination Mains. After confirming the Mains 2019 eligibility condition, when you go for making online JEE Main 2019 Registration, you may face hindrances if you are unaware of the accurate procedure to apply online. To take you out of this dilemma, Eduncle has come up with proper and easy to understand guidelines to apply online for JEE Main 2019. Making Online/ Offline payment etc. 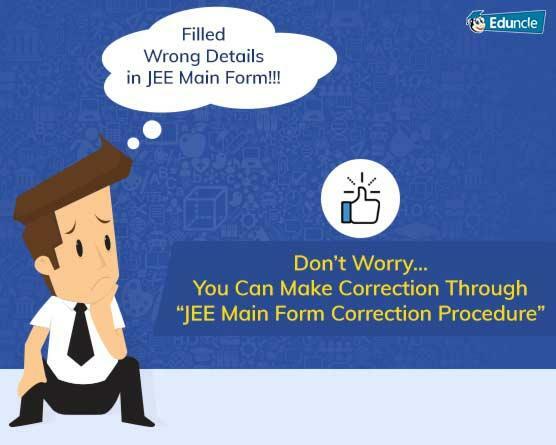 While filling the JEE Main 2019 form, many candidates can fill inaccurate details by mistake. These mistakes could be in the form of spelling mistakes in their personal details, errors at the time of uploading the images (Photo and Signatures), incomplete educational details etc. The board repeatedly found these kinds of mistakes in the Main 2019 application forms, which made them take a decision of making a process that could provide the candidates a second chance to rectify the mistakes that occurred at the time of filling the application. NTA releases dates for the same which is announced after a few weeks of ending the online application process. Read the complete information by visiting JEE Main 2019 Form Correction Blog. Want to know which type of questions might come in JEE Main 2019? Solve Model Papers & Smart Up Your Preparations. Download FREE PDF Here. To start your JEE Mains 2019 preparation, the basic element that you will need is the updated and accurate syllabus. The syllabus must contain all the important topics from which you will be expecting questions in JEE Main 2019 Exam. Let's know some key facts regarding JEE Main 2019 syllabus to help you in getting right direction for preparation. Have a look! The syllabus will be having level similar to your 10+2 level. Your studies for academics will be helpful for you in your Joint Entrance Examination preparation. The topics that you study in your class 11th and 12th books can construct the base for JEE Main 2019 syllabus. But, you must give a thorough look upon the complete syllabus as there are some topics that could differ from your academic syllabus. To grab the entire layout of JEE Mains Exam syllabus, you must study JEE Mains Syllabus. Joint Entrance Exam (Mains) 2019 includes two phases - Paper 1 and Paper 2. Paper 1 will conduct in online mode whereas paper 2 will conduct in offline mode. Paper 1 and Paper 2 are conducted for different disciplines. Joint Entrance Examination (Main) Paper 1 is for admission in B. E or B. Tech whereas Joint Entrance Examination (Main) Paper 2 is for admission in B. Arch or B. Planning. Candidates can make choice between these two or they can opt for both the papers while applying online for JEE Mains Exam. To know the complete details regarding the subjects, number of questions, and marking scheme of Mains examination, you may refer to - JEE Main Paper Pattern. As the exam dates come closer, you start making assumption regarding the strategies you are going to adopt to reach your goal of cracking IIT JEE Mains 2019 Exam. But you may find your efforts might sometimes go in vain when your strategies don’t prove perfect. This may lead your mind feeling stressed. Tips to score more in Physics, Chemistry, Mathematics and Paper 2. Important chapters to be prepared in all three sections. Tricks that will help you in cracking JEE Main 2019 without coaching. During studies, you might also be having a question in your mind - “What are the best books for JEE Mains Preparation?” Isn’t it? Books are the most requisite ingredient for carrying out your studies smoothly. But, the smooth process will be continued only if you are approaching the accurate and excellent books. Don’t get stressed! 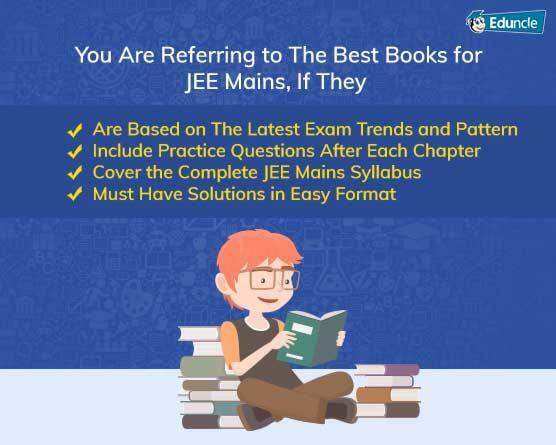 Here we are with the collection of the Best Books for JEE Mains that you must study to get mastery over all the important topics in your syllabus. Along with a perfect preparation strategy, you must take up a proper JEE Main 2019 study plan to start your studies. The reason is that you might not find time for preparing all the subjects you need to study. But, to crack Joint Entrance Examination (Mains) 2019 and gain good marks at JEE Main result time, you must allot required time. Therefore, it becomes a necessity to possess a solid study schedule. Day wise plan for each topic. What If 40% Efforts Can Get You 70% Scores! Be Smart & Have the List of JEE Main 2019 Most Important Topics With their Marking Weightage. Download Free PDF. Contemplating the statement “Practice make a man perfect”, we would like to suggest you that in accordance with your JEE Main 2019 Exam planning and preparation, you must organise time for solving and practicing JEE Mains Question Paper with Solutions. To make you become familiar about the exam pattern and the marking scheme, it is advised to practice as much previous year JEE Mains paper as you can. The top rankers, who cracked the exam in their initials attempts, mention solving minimum 5-10 years’ questions papers along with JEE Main Answer Keys before appearing in the exam. You can download JEE Main 2018 Papers (Paper 1 & 2) for Physics, Chemistry, and Mathematics. You will be able to practice previous year Joint Entrance Examination (Mains) exam papers for 5 years. The article will tell you the importance and the appropriate way of solving the JEE Main 2019 question paper with solution. After appearing in JEE Mains Exam 2019, the students have a common determination in their minds. They all start making calculations regarding the correct and wrong attempts made by them. But without knowing the correct answers, nobody is able to guess the nearest scores they have made in the exam. Here, arises the need of JEE Main official answers keys. Generally, 2-3 weeks after the completion of Mains exam, the board releases IIT JEE Mains answer keys. After the release, you can check your marked answers were correct or not. The board will also invite candidates’ challenges against JEE Main answer key 2019. Addition to this, while practicing the previous question papers, you may feel the importance of JEE Main answer keys to know the correct answers and test whether you have marked the correct one or not? At this platform, you can easily download Joint Entrance Examination (Main) 2019 Answer Key along with the answers keys for previous papers. Have you ever tried going to appear for any exam without Admit Card? Obviously not! Because if you do so, you will be restricted outside the exam hall. Likewise, JEE Main 2019 Admit Card plays the vital role in the verification process while entering the exam hall for appearing in JEE Mains exam. Important dates to download the Admit Card of JEE Mains 2019. Accurate procedure for JEE Main hall ticket download. Solutions if you forget Mains Application number. Details you must check after downloading the JEE Main 2019 admit card. The day students realize that there are only a few days remaining for JEE Main 2019 Exam, they start losing their courage. This feeling remains same even for those students who have prepared well and are having enough time to revise what they studied. Therefore, as JEE Main Exam Date come closer, your focus should be diverted more towards planning the strategies for the last days before the exam and to attempt the exam paper in a careful manner. Now, you might be speculating about what would be strategies that you need to work upon and how could you test if they work or not! 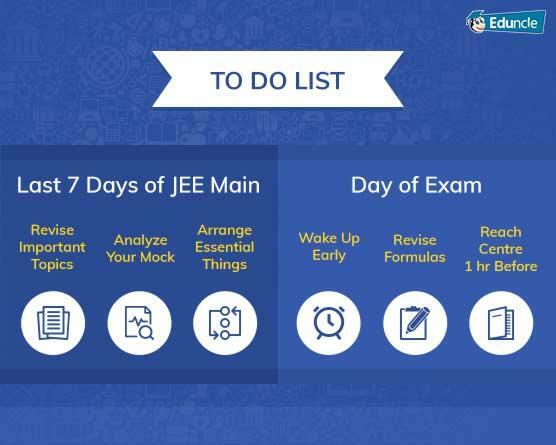 What you need to do in the last few weeks before JEE Main 2019? How you manage to cover up the important topics in last few days. What should be your step by step activities on the day of exam? How will you attempt the JEE Mains Exam paper without wasting a minimal amount of time? JEE Main 2019 exam is undoubtedly a difficult entrance exam among the ones which are being conducted in our country. Innumerable students appear for the exam but it’s a tough fact that only a few percentage of those students can actually be able to sweep over it. The level of competitiveness for the exam affects the level of difficulties in the Joint Entrance Examination (Mains) paper which can be find out with the help of JEE Main 2019 Exam Analysis. It can be helpful for both the crowds, those who have appeared in the exam and those who might be planning to appear for the exam. Topics from which most of the questions were asked. Level of toughness in exam. Expected JEE Main 2019 cut off marks. Get the Complete Analysis of JEE Main 2018 Question Paper by Exam Experts. Download FREE PDF. From the day of JEE Main 2019 Exam, you all might start guessing your scores. Since you hear the news of announcing JEE Main Result 2019, you can’t wait till it get declared and you check your scores. Every student who appeared for the exam, wants to score well and want to see their wish of joining India’s best science and technology institutions come true. Your JEE Main 2019 Result defines the smart work that you have done at the time of preparing the exam. NTA announced the JEE Main 2019 Result for January Exam on 19th January 2019 on official website and will declare the result for April Exam on 30th April 2019. NTA will use “Normalization procedure based on Percentile Score” for comparing JEE Mains 2019 scores across multi session papers. It will ensure that candidates are neither benefitted nor disadvantaged due to the difficulty level of examination. The candidates, who qualify the exam will be able to participate in JoSAA (Joint Seat Allocation Authority) Council to get selected in various NITs, IIITs, and CFTIs based on their scores in JEE Main 2019 merit list. With the announcement of the JEE Main results, candidates will be able to see their scorecard consisting their marks obtained, cut offs, their eligibility for applying Joint Entrance Examination (Advanced) and the All India Rank List. The JEE Main Results for January Exam has been announced on 19th January 2019, the percentile score has been released. The JEE Main Rank would be released in April 2019. The list is prepared based on the marks obtained by the candidates in the entrance exam ignoring the marks obtained in 12th class examination. Joint Entrance Examination (Mains) All India Rank List. Procedure to download JEE Mains Rank Card. Important points regarding the rank card and list. Procedure of preparing Mains rank list. The list of toppers in the respective exam. The analysis of Marks vs Ranks. JEE Main 2019 counselling process is the concluding procedure of the admission process through Joint Entrance Examination (Mains). The counselling process will be held after the commencement of both offline and online exam by JoSAA. Under the process, the candidates will be invited based on the rank obtained by them in the JEE Main merit list 2019. This year, we may expect JEE Main 2019 counselling in the month of July 2019. Eligibility criteria for JEE Mains counselling 2019 (Paper 1 & 2). Important dates regarding the counselling process. Exact procedure followed by the board for counselling. Documents to be kept with you. JoSAA 2019 online choice filling procedure. Fee payment and document verification. Final reporting to the allotted institutes. You can see there are countless institutes that are offering admissions to those candidates who qualify the JEE Main 2019 Exam. These institutes offer admissions based on the candidates scores, marks and ranks in the entrance exam. These institutes are also called as Joint Entrance Examination (Main) participating institutes that includes various NITs, IIITs, CFTIs etc. The number of institutions participating may vary according the decision taken by NTA regarding the release of JEE Main 2019 rank list. If you are interested in getting the complete list, you must go through our article on JEE Main Colleges. Dear Aspirants! Qualifying JEE Main 2019 Exam can be compared to threading the eye of a needle. Not an impossible one! Right? Yes, it is absolutely possible, but only by investing exhaustive concentration and practice. If you prepare by putting smart work and patience, you can easily sail across the nerve wrecking and stressful feeling that you face throughout the admission process. 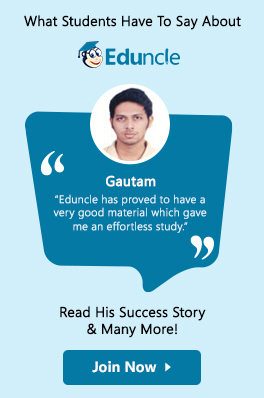 Eduncle will always be guiding you in making your studies comfortable and grabbing the positive results. We have numerous information to provide you through our social media platforms; Facebook and YouTube. By following us you can be benefitted with the daily doses of knowledge, recent updates, quizzes and online videos. Move ahead persistently like a river, and you will surely be able to cut the rock. Stay focused and be confident at your aim. Best of Luck Aspirants! 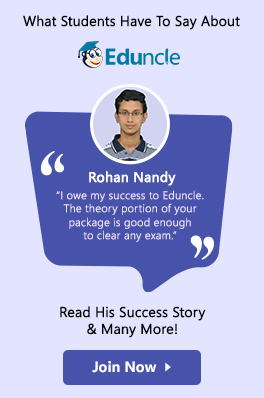 Stay in touch with Eduncle for each and every update related to JEE Main exam 2019. Thank you for reading! ? ?